These are what I call REALLY great muffins. Every time I go to get a coffee somewhere, I always crave a blueberry muffin. I have to say that they aren’t as good as muffins you can make at home. Most of the times they don’t have a streusel topping. A great muffin has got to have a streusel topping! What is a blueberry banana muffin without one? It’s a pretty mediocre muffin. What’s so beautiful about this recipe is that it’s all stirred by hand. No electric mixer is needed. Be sure to not overstir. It’s quite alright if the batter is a little lumpy. Too much stirring will only get you tough muffins. If you’re looking for something really easy to have your kids bake for you (with adult supervision on the oven part), this is the recipe that they could make just for you! What mom wouldn’t want to wake up tomorrow morning to a fresh batch of blueberry banana muffins with a little extra streusel topping. The muffins were scorching hot just out of the oven. I had to wait a few minutes to pull one apart to show you the juicy berries and how moist they were. These muffins are delicate, not too heavy and you could use butter instead of margarine for the streusel topping if you’re not trying to make them vegan. This is my go-to muffin recipe that is so easy to put together and you can add whatever berry or even chocolate chips! To all my mommy friends: Happy Mother’s Day! You deserve a dozen muffins-enjoy your day. 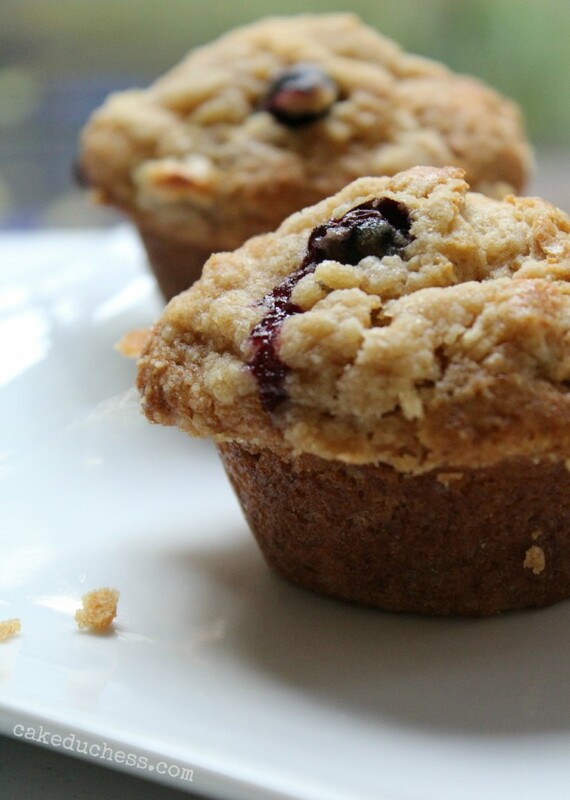 Soft blueberry muffins packed with banana flavor and a streusel topping. For topping, in a small bowl, combine the brown sugar, flour and cinnamon; with your fingers, incorporate the margarine to the flour mixture until crumbly. Sprinkle topping over the muffins. I´ll have all the muffin tops with the streusel only. Any cake or muffin with streusel is a winner. They are delectable Lora! I can imagine the smell while baking. 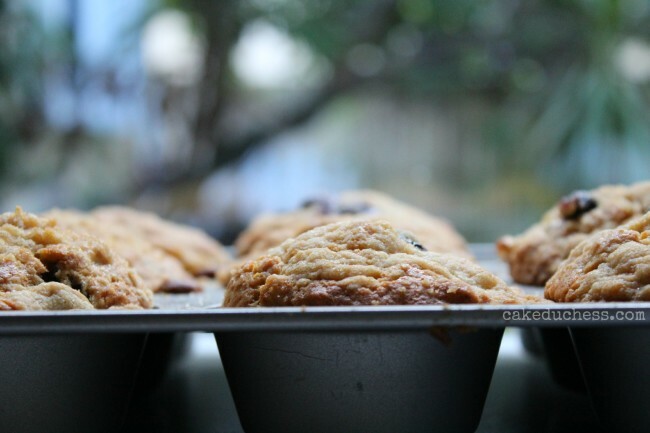 Delicious muffins, I love streusel top in coffee cake and muffins. I love the streusel topping on your muffins! They look so puffy, fluffy & love all that streusel topping! I agree, streusel is a must! These look wonderful. 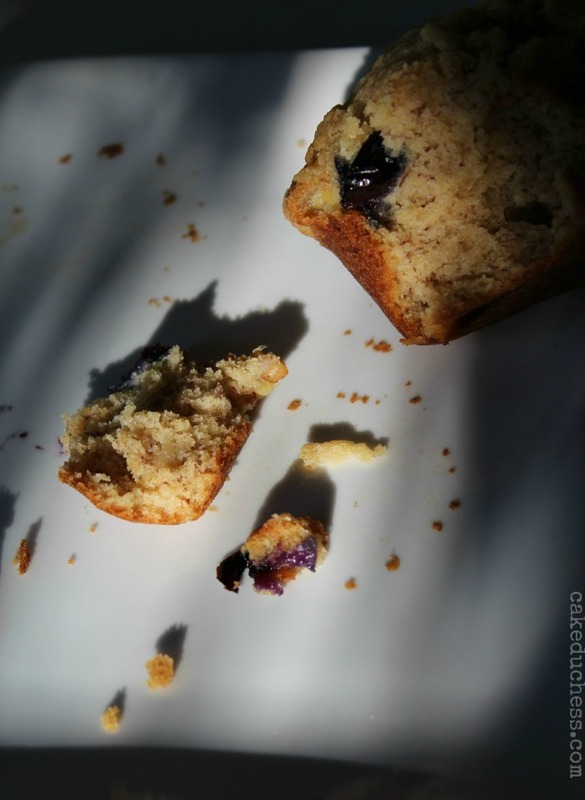 I'm always on the hunt for a good blueberry muffin and yours look perfect, Lora! So fluffy and moist inside. And that is one serious streusel topping. One of these days, I just want to bake a pan of streusel and eat it alone, that's how much I love it! I made a batch of these this morning to have as a snack when a girlfriend came over to visit. We both have dairy issues and so if we want a treat we have to make it ourselves or suffer the consequences. These were totally worth the time and effort– they were very quick and easy to make with minimal cleanup. We both thought they were SO tasty. Thanks for sharing such a fantastic recipe! I have all of these ingredients in the house and the muffins are in the oven. Looking forward to trying them! My hubby made these today for Sunday brunch, they were delish. The only problem he had with the recipe was that the instructions didn't indicate when to add the baking powder, unless it's to be added as a part of the "spices". They still were yummy and we will be making them again – this time with the baking powder just to see what difference having it in the muffins makes in the final product. Thanks for the recipe! hello, just wondering, would it be ok to substitute the almond milk + apple cider vinegar mixture with normal milk? Thanks for the recipe though, I can't wait to try it, the muffins look delicious! This recipe looks fantastic! Just wondering if you can use soy milk instead of almond… or if it would react strange with the apple cider vinegar?? I'll try it and see since that's what I've got. Looking for a yummy way to use the blueberries my kids picked yesterday! Thanks! I had some blueberries and bananas that had to be used and found your recipe – I will never use another muffin recipe- these we're perfect. Thank you! I wanted to find a good use for a couple of over-ripe bananas. This recipe was quick and easy. The muffins are delicious! Thank you so much! Lovely! Can't wait to try! Altough I must say I am tempted do doubling the streusel topping just because it's SO YUMMY! Thanks for sharing!